That pretty much sums up our reason for choosing to be “in the hills.” Peace and tranquility are worth far more to us than convenience. We think that since mankind was created to live in a garden, the country life is the best for our family too. Sure, it comes at a cost. There is no cheap, fast internet here. There is not even a mail delivery service where we live. That just happened to be where we ended up–we are too far from a telephone exchange and the mail carrier stops just down the road. It’s further to town, work and shopping from here than from a place in the ‘burbs. But that’s a cost we are willing to pay. 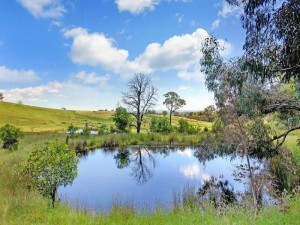 One of our two dams. Some things were a bargain. The view from the hills is worth a million dollars, although we didn’t pay anywhere near that. The fresh air and the quiet calm are the kinds of things that many people have to go away on holidays to find. There are other costs that we don’t have to pay. There are no hoons doing burnouts on the street just outside our front door. No highway noise. No smog. No street lights shining in the window making it hard to sleep. The freeway headed our way out of the city is one of the last places where the traffic still keeps moving at rush hour, and if you want a more scenic route, you can avoid the rush altogether and cut across the country roads. I’m going to go down to the local organic farmer today and buy some juicy ripe strawberries for a treat. And pretty soon I hope that my children can enjoy some of our own strawberries grown at their very doorstep. Amen!! There are some things in life you just can’t put a dollar value on it. Yes, like views, fresh air, peace and quiet, having your kids able to run around in God’s beautiful world. You mention that it comes at a cost, but just think what you save, and what you are giving to your children. I wouldn’t live anywhere else except in God’s beautiful country. Just don’t forget to invite me when your strawberries are bearing fruit. Yunny!